Neil replaces Dave as president and Dave takes a rest……………. It was goodbye to our captain Neil Simpson, who has completed his 12 month stint and will pass the baton to Ken Saunders on Monday. A most successful year with the society going from strength to strength. 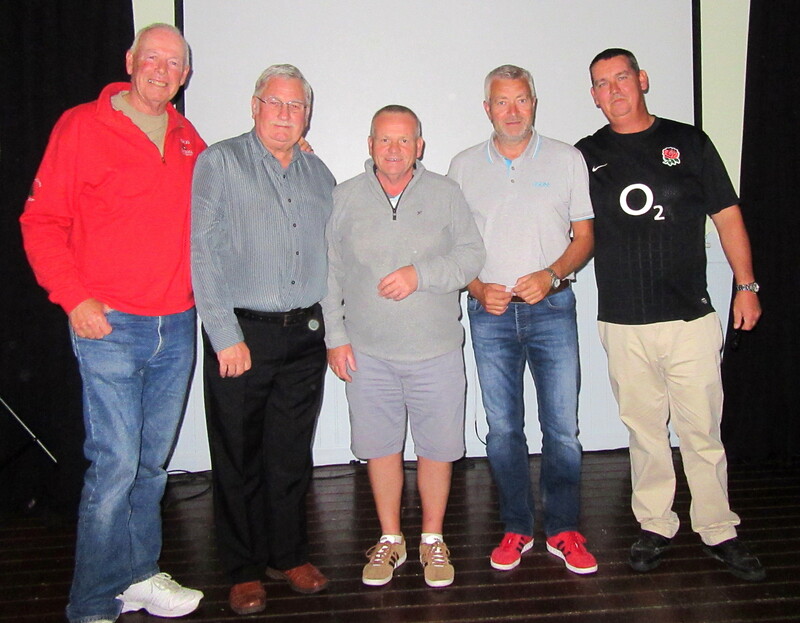 Also thanks to Dave Lloyd, who will not be on the committee this year. Dave was a founder of the society and has been involved in many of the progressive initiatives taken over the last seven years. Enjoy your rest, we will still look to you for advice in the future. The weather forecast was so bad for the scramble that the competition was nearly changed to an individual stableford in case players failed to turn up. 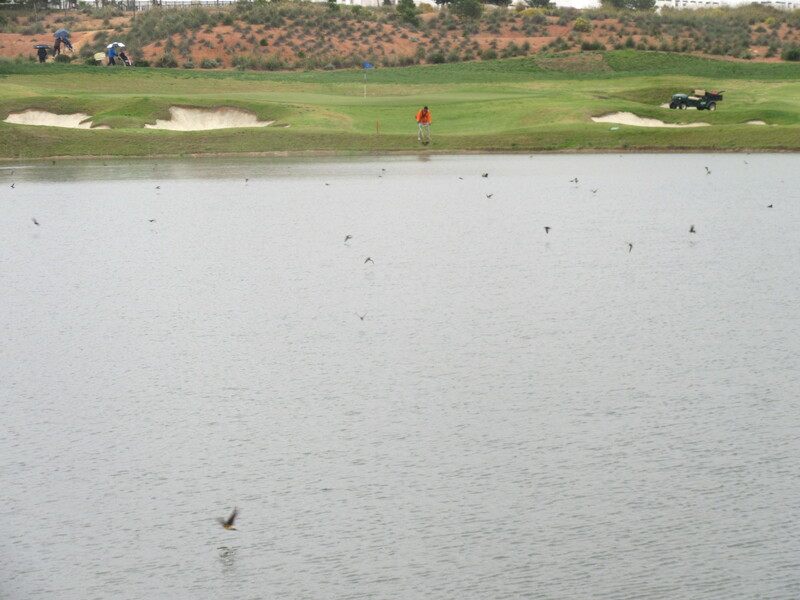 But all of the 48 golfers (and 4 guests) arrived, and with no rain at 08.30 off we went. 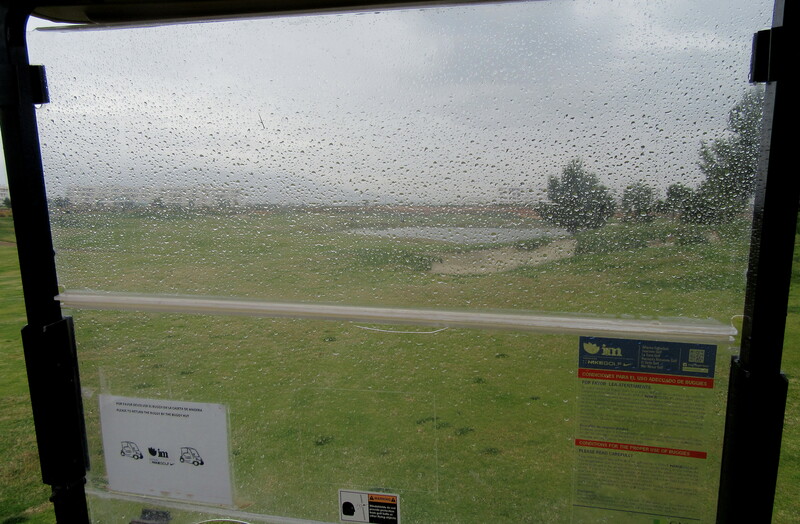 A few spots of rain for the early starters, with the temperature dropping as we played the last few holes, but then the players were coming into the bar soaked to the skin and talking of going home for a hot shower! Still, there were some excellent scores with not much between the teams. So frustrating for us to lose by 0.6 when we had all our drives in by hole 17, then the 4 of us sprayed our drives everywhere at 18 followed by missed putts from 6 feet for our only bogey. The winners came from behind to pip us with a birdie at the last, so well done! 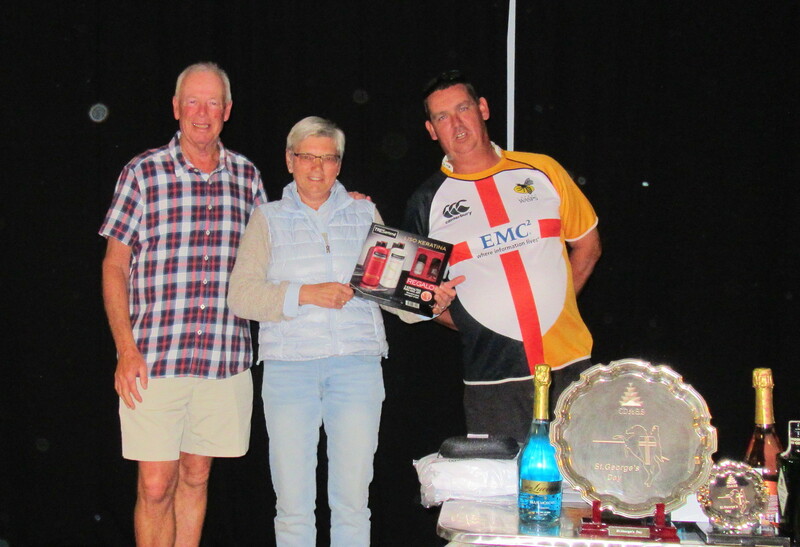 Fran Thomas joined the players in form to take first prize – Paul, John and Pete have been on the podium on a regular basis in recent weeks. John, Fran, Paul – Pete not available……………..
Barry, Kev and Neil – I was at the airport. 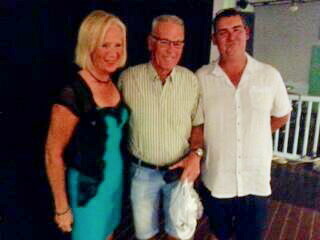 My deputy photographer ( Barry) couldn’t take the picture because he was on it! Please note that times for Monday and Wednesday have been brought forward by 30 minutes. Next week is President’s Day, the 3rd major of the year and looks certain to attract a big entry. If you want to play get your name down now! Getting close to the away day at Roda – if you want to join us on Monday May 22nd contact me or Dave Lloyd – (see, he hasn’t got away completely!). 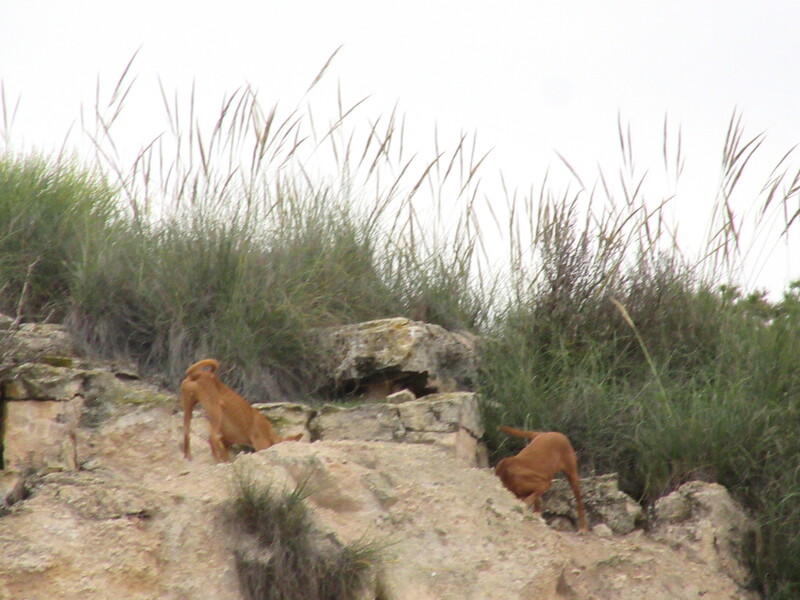 two wild dogs running around by the first tee looking for a meal………..
the house martens swoop over the water in search of insects – hope they weren’t all after the same one! .Sorry guys, I am afraid I thought this was so funny (and true!) that I had to expose our secrets! P.S. better with the sound on! A typically English day for the 55 players – a chilling wind and only brief glimpses of the sun. Maybe the players were dressed in red and white, but you couldn’t tell as everyone was wrapped up in waterproof or windproof attire. 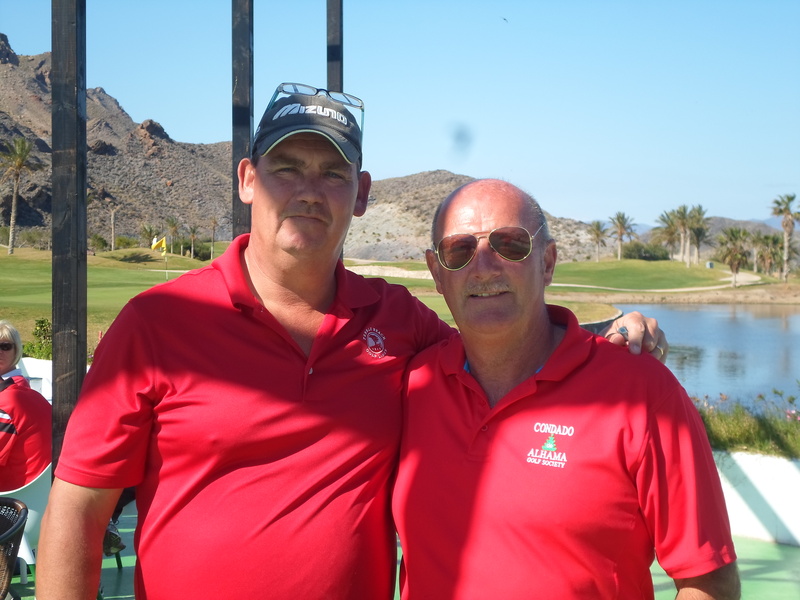 Paul Harrington conquered the conditions with a great score of 39 points off his handicap of 3.8. 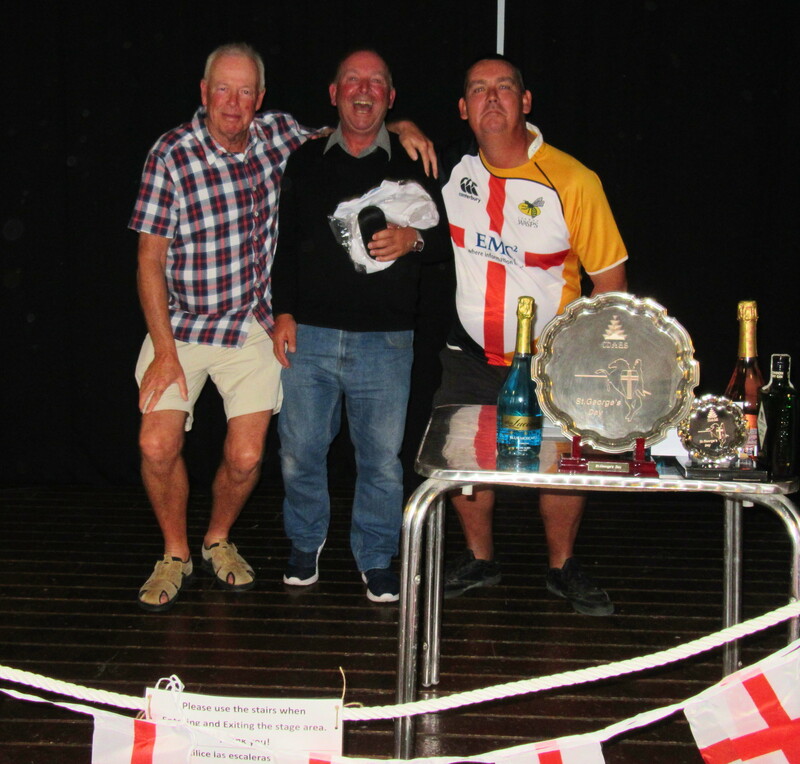 Thanks to our sponsors, Trophy Box, who supplied the salver and replica. 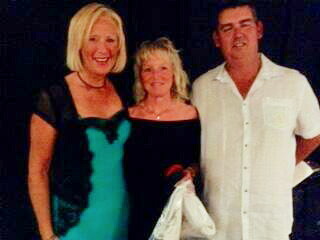 Kim was the par 5 specialist………..
and Gro had the best aggregate at the short holes………. 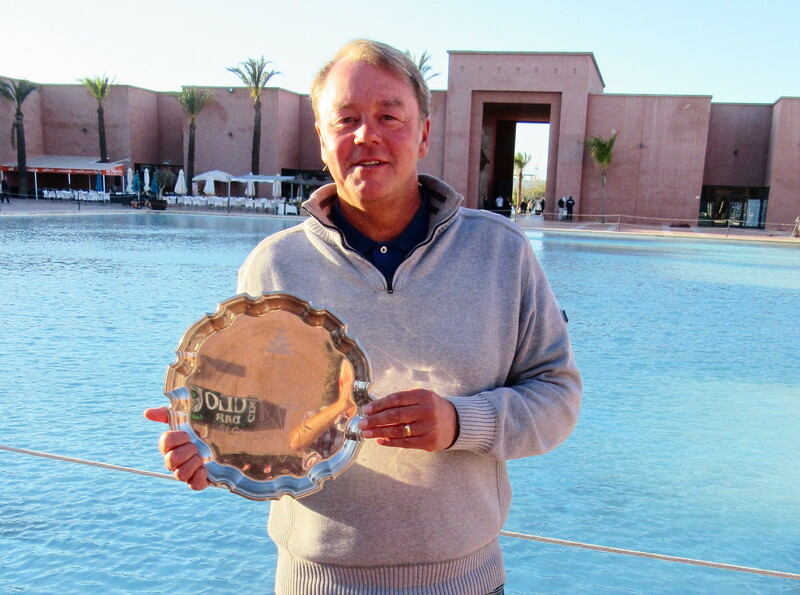 Borre was nearest in 2 on hole 8……………..
and Borre’s wife Sissel won the ladies – just missed out on countback for the main prize…………..
John was closest on 17……..
All the 5 lakes are full to the maximum – one result of this is that everyone of them have several nesting birds attracted back……….here is a coot protecting her eggs. And husband Sven Erik tries for closest to the pin on 17…………he failed! Barry Answer had a fine round going until this tee shot on 18………lost in the bush, and his 3rd off the tee finished about 2 yards further – so playing 4 from behind the ladies tee………..unfortunately this mishap cost him a prize – the divisional winner was only 2 shots clear of his 33 points. We sent out a helicopter to see if his lost ball could be spotted from above…………. Next week is the Captain’s farewell, which Neil has decided will be a 4 person texas scramble. And the sheet is also in the shop for the President’s prize for May 5th. 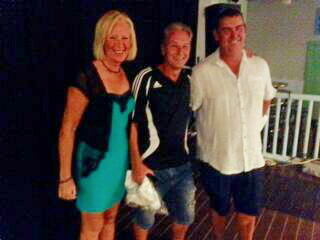 the winners, Kevin and Liv……………. There was a great turn out in the Clover Bar on Wednesday evening in anticipation of the pairs draw. There were a few gasps and sighs as the names were called out. There was a complete field of 72 players on the sign up list however a couple of players had not paid their yearly subscription or had informed a friend or committee member of a late arrival, so they had to be drawn at the end of the field and play as guests. The weather was perfect reaching approximately 31 degrees during the afternoon. However, this sudden increase in heat exhausted some of the players toward the end of their play. The scores showed that the pairings were fair as there was on 16 shots between the first and last places. Although a couple of players did not complete the course as they had failed to remember that it was a stroke play competition. 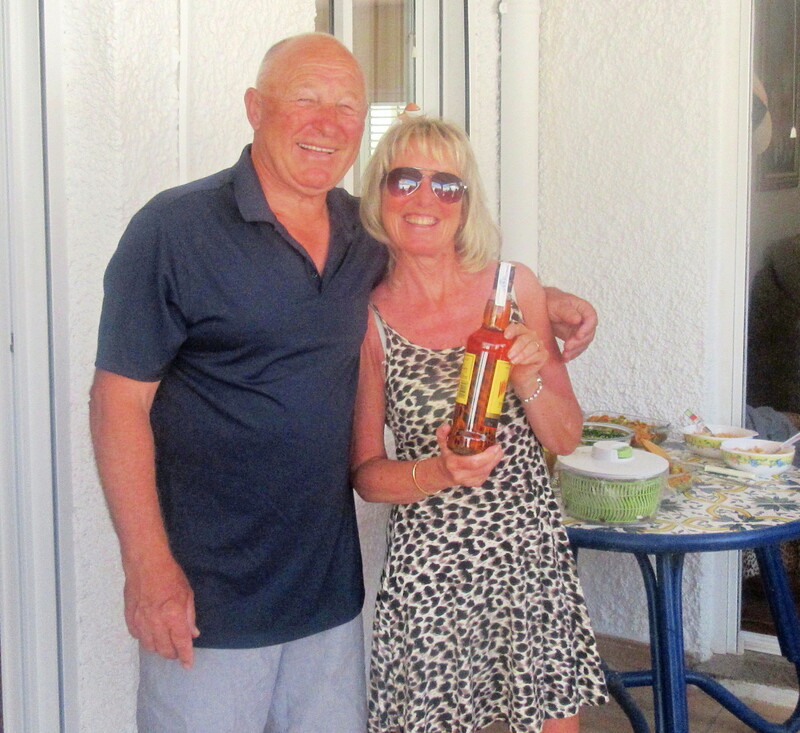 Chris Robb and Fran Thomas – unfortunately it wasn’t a good day at golf for Fran on his birthday. Mens nearest to the pin on 17 – George Hoskins (The players congratulated George on his recent engagement and wish them well for the future). 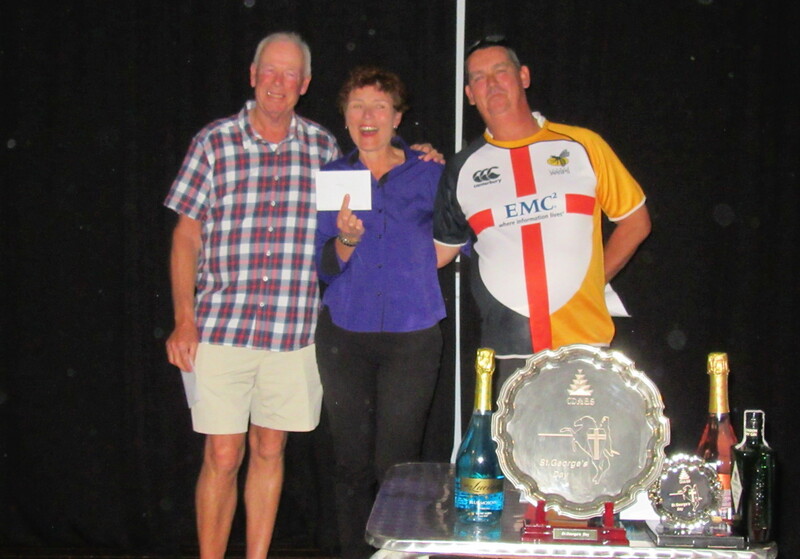 Here are what photos were available of the winners………. 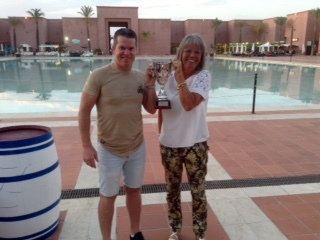 Graham was closest in 2 on 8…………..
Chris and Fran won the booby……………..
Just an update on Masterscoreboard – due to some technical issues on the online booking system we have had to suspend this facility temporarily. Therefore until we resolve these issues we will revert to the original system of booking either through bookings@cdagolf.com or selecting your tee times at the Wednesday night meeting or the start sheets in the clubhouse. Next Friday 21st April is the St Georges Day singles stableford competition. The sheet is available in the shop. Again the presentation will be at the later time of 7.30 pm in the Clover. The players list for Presidents Day golf on Friday 5th May will be available from Wednesday. Alicia and Kim will be selling tickets for the evening event on Wednesday evening. It is at La Siena Restaurant, Mazarron Town , or email events@cdagolf.com. Tickets are only 15 Euros and includes transport, entertainment by Andy Winwood and 4 course dinner with drink. 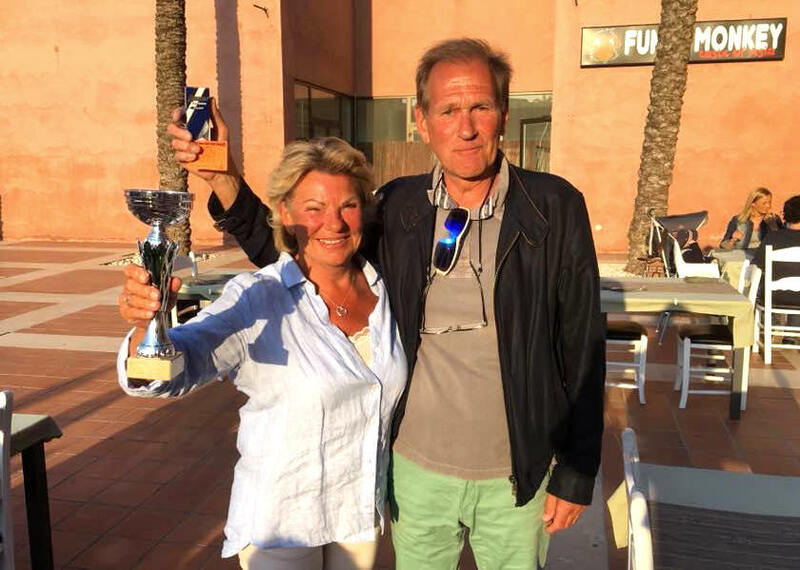 Good friends Ellen and Ove were both winners….. It was the ladies’ day on Friday with the two best scores coming from Ellen Gulbrandsen and Liv Haland. 62 players with 2 guests competed on a sunny day with fast tricky greens. a fine round from Chris, although an uncharacteristic blob on 17 spoilt it a little……. Rune and Inger Wingsternes came across this on the 18th fairway – it didn’t like being poked with a stick and started hissing…………..
Was it related to this one that I found sleeping on my car windscreen last year? No, this one was a vindscreen viper……..
Next week is the second major of the year, the Graham White pairs strokeplay. Partners and times will be drawn out at 7.30pm in the Clover on Wednesday 12th April. Sorry to hear that one of our original members is leaving Condado and returning to Ireland. 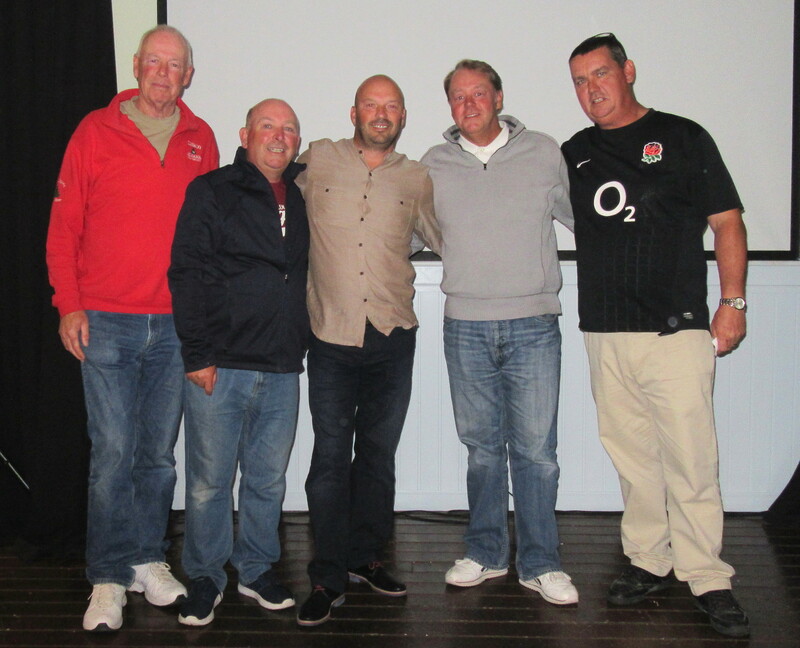 Fred Twomey formally hands over ownership of the longest ball retriever to his rival, Sandy Simpson………. 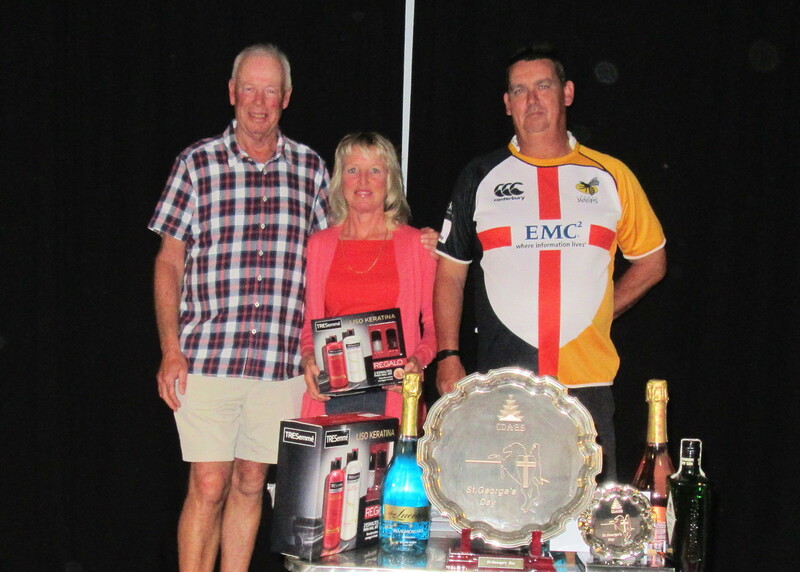 We have now run out of golf ball sleeves as prizes for a two………..thanks to Dave Cooke who has supported us in the past, but if anyone would like to sponsor these please let a committee member know. 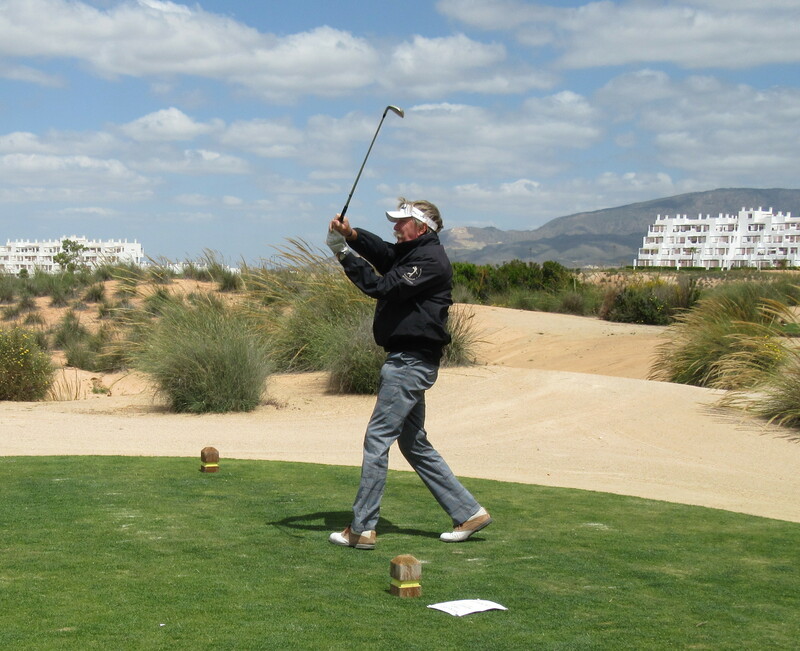 Next Tuesday, the 11th of April, myself and the professional teaching staff of the GNK Golf Academy we be at La Torre Golf. From 14.00-16.00 we will be giving free mini lessons, tips and advice. All are welcome and I would appreciate it if you could inform you society members in case any of them would like join us. Note that our local rules are listed in the PAGES section on the front page of this blog. Early days, but many of you may find that you can’t access the link to masterscoreboard. I had the same problem, but was denied with my password. I need confirmation, but try entering highhandicap97 then CHANGE your password – it worked for me. 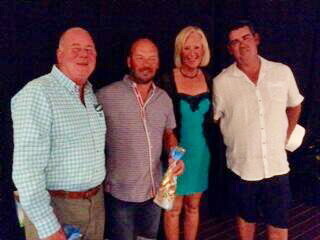 Svein Erik, Jan, Ellen & Lis……………..
48 players this week in the 4 person team event with 2 counting on par 3’s, 3 on par 4’s and 4 on par 5’s. When 4 of us couldn’t score a single point on hole 10 we knew our race was run! 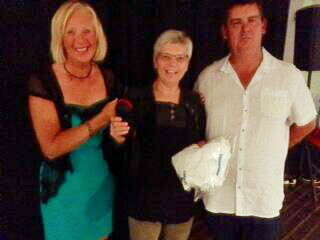 However although we were nowhere near the prizes, the winners came in with a surprisingly low score. Lots must have rued those missed putts (and balls in the lakes!). 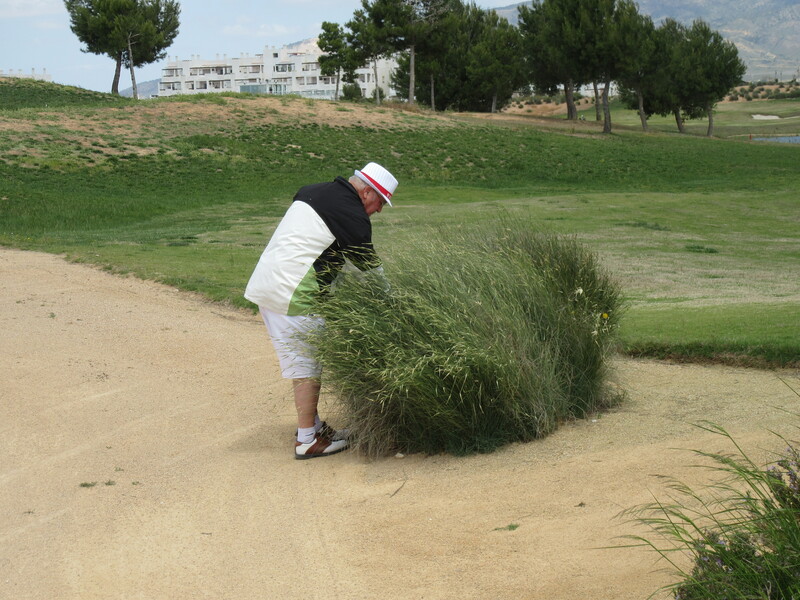 Also back out on the course……………..
Eamon Barry sets up for his trademark draw on the 10th…………. 2 photos in one………. 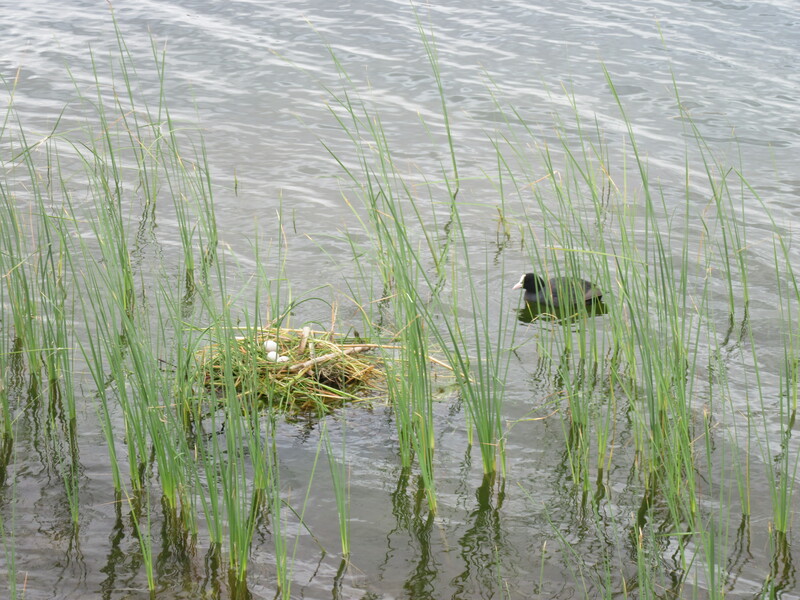 Kev’s tee shot over the lake on 11 finished close, while Kim plays from the bunker on hole 10…………………. 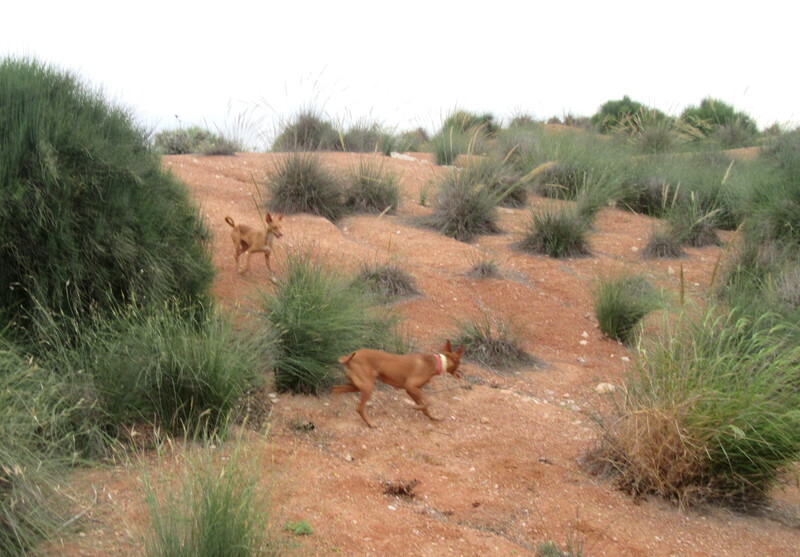 Work is still ongoing on the course – progress may be slow but everything is improving. This week saw the first leg of the GNK summer tournament where a stableford is played each month at each of the 6 courses. 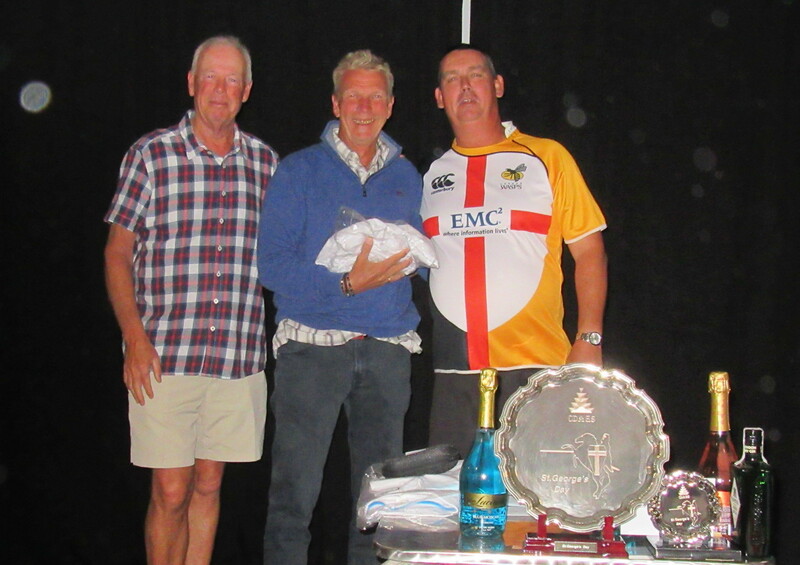 This week was Saurines, and congratulations to Dave Lloyd who finished second in category one. Well done Dave! Some good offers for society members – at Diversity Golf Club there is 10% off food Monday, Wednesday and Friday if you show your membership card. Also 10% off drinks on society days. Also a similar deal at the Condado Club with 10% off food every day (except Sundays) for our members. Online booking is now available, but only to current members (membership is due April 1st). But others not here to renew can still book through me (barry@cdagolf.com) or the old site which has been re-introduced (bookings@cdagolf.com). Also access to the results on masterscoreboard may be a problem? as new members will not be keyed into the system until later today. The new white society polo shirts are selling well and can be purchased from Kevin at only 15€. Next week is the April Apollo Air individual stableford. Cashier: “Yes, I know who you are Sir, but with all the bank regulations, monitoring, impostors and forgers etc., I must insist on seeing some identification”. Cashier: “I’m sorry Sir, but these are the bank rules and I must follow them”. Corbyn: “I’m urging you, please cash this cheque for me”. Cashier: “Look Sir, this is what we can do. One day Colin Montgomery came into the bank without any ID. To prove he was Colin Montgomery he pulled out his putter and putted a ball along the floor and into a small cup. With that sort of skill we knew it was Colin Montgomery and we cashed his cheque. Cashier: “Will it be large or small notes you require Mr Corbyn?